Travels in Geology: Dominica: The Caribbean "Nature Island"
What do you think was the most pervasive earth science news story this year? The recent chair of a National Academy of Sciences committee to study climate change discusses the continuing controversy surrounding some key climate studies, including recent congressional hearings on the topic. This year's discovery of a 375-million-year-old transitional fish fossil is changing how scientists think about the evolutionary transition from water to land. The chief economist for the American Petroleum Institute discusses the oil market's ups and downs this year and how global events continue to shape prices. A small moon orbiting Saturn that has unique Earth-like qualities, is the big planetary science story this year, according to one researcher. Efforts have ramped up this year to enable global tsunami warnings, and new technologies are helping, according to one tsunami program manager. Geoscientists have a role to play in helping policy-makers and international aid organizations realize that funding natural hazards risk reduction programs is worthwhile. Partisanship and a focus on emergency spending were largely to blame for Congress’ stalling on legislation to manage the long-term interests of U.S. resources. Learn how a coal enthusiast became a carbon sequestration booster. 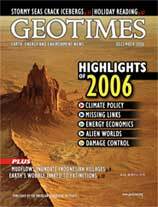 The cover image is of Shiprock, the remains of a dormant volcano in New Mexico. Photograph is copyright of Michael Collier.